PRIVATE GUIDING AND GENEALOGY RESEARCH SERVICES IN CENTRAL EUROPE. AUSCHWITZ - BIRKENAU , CRACOW, WARSAW AND HOLOCAUST SITES EXPERT TOURS. 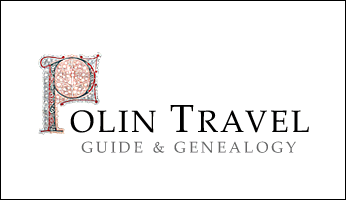 Polin Travel is a firm and research center created out of passion for guiding, history and genealogy. This is the first project in Central Europe combining those three fields in order to provide high quality, individual travel and research services for visitors with different backgrounds and expectations. The firm was created in 2000 in Cracow and has been directed since then by Tomasz Cebulski, Ph.D.
We specialize in Jewish guiding and genealogy services in Poland but we also work in other fields like Christian genealogy in Poland and regular private, expert guided tours to most popular travel destinations around Cracow and Central Europe. We have special academically designed travel itineraries to Auschwitz-Birkenau Museum, Cracow, Kazimierz, Wieliczka Salt Mine and majority of Jewish heritage and Holocaust related sites in Poland. We guide our tours and lead genealogical research mainly in Poland and former Galicia territory (nowadays partly in Ukraine). Our guiding and genealogy research services also cover the territories of Slovakia, Czech Republic, Germany, Lithuania, Ukraine and other countries of Central Europe. We have a broad range of experts in tourism, research and education in Central Europe to be able to customize your tour and provide an unforgettable and enlightening travel opportunity. Last years brought us a lot of experience with different projects starting with Jewish genealogical researches for individual families, through projects for families of Holocaust survivors, finishing on large, student field tours focusing on Holocaust and minorities heritage in Europe. Among our clients and partners we have universities, museums, high schools or Jewish communities from the USA, Canada, Great Britain and Israel. All our tours and research projects are tailor-made and are privately guided because we believe in quality, not quantity. Quality, which was valued by many of our former guests who had decided to use our services: Oprah Winfrey, Elie Wiesel, Steven Pinker among the others. Private, individually guided tour of Auschwitz-Birkenau, Cracow Ghetto, Schindler's Factory and Plaszow Camp. Years of experience have thought us about different motivations of visitors coming to see Auschwitz-Birkenau. Noticing the serious drawbacks of growing mass touristic visits we decided to offer one day private tours of Auschwitz, according to our academically developed and experience based itinerary. Private, individually guided tour of Cracow, Kazimierz, Cracow Ghetto and Schindler's Factory. There is much about Cracow and Kazimierz which is conceived from the eyes of visitors in the city's history, legends and atmosphere. A good guide on a well-conducted tour can easily unveil this invisible dimension. Private, individually guided tour of Polish Shtetls. One day tour itinerary based on splendid history of Jewish communities in Poland and Galicia. Villages and cities which before WW II were the very essence of Jewish life in Poland are now waiting to be re-discovered. Private, individually guided tour of Lublin / Majdanek and Action Reinchard Death Camps of Treblinka, Bełzec and Sobibor. The three death camps of Treblinka, Belzec and Sobibor represent the ultimate evil of the German Nazis and ultimate destruction of Polish Jewry. Those places are often scarcely known about because the Nazis did their best so that we would not remember them.